Magical Urban Fantasy Reads: The Darkest Part of the Forest Tour Stop + Giveaway! The Darkest Part of the Forest Tour Stop + Giveaway! Holly Black is the author of bestselling contemporary fantasy books for kids and teens. Some of her titles include The Spiderwick Chronicles (with Tony DiTerlizzi), The Modern Faerie Tale series, the Curse Workers series, Doll Bones, and The Coldest Girl in Coldtown. She has been a finalist for the Mythopoeic Award and for an Eisner Award, and the recipient of both an Andre Norton Award and a Newbery Honor. 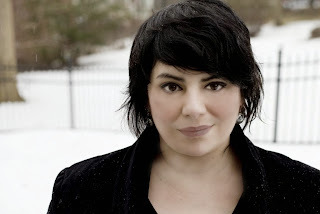 Her new books are The Darkest Part of the Forest, a return to faerie fiction, and The Iron Trial, the first book in a middle grade fantasy series, Magisterium, co-authored by Cassandra Clare. Holly currently lives in New England with her husband and son in a house with a secret door. Down a path worn into the woods, past a stream and a hollowed- out log full of pill bugs and termites, was a glass coffin. It rested right on the ground, and in it slept a boy with horns on his head and ears as pointed as knives. Hazel kissed boys for all kinds of reasons— because they were cute, because she was a little drunk, because she was bored, because they let her, because it was fun, because they looked lonely, because it blotted out her fears for a while, because she wasn’t sure how many kisses she had left. “Hazel, Hazel, blue of eye. Kissed the boys and made them cry,” Carter said, because Carter could be a jerk. Anyone who offers up their heart on a silver platter deserves what they get. There was only one way to get over a boy. Only one way that ever worked. Across the clearing, illuminated by Stephen’s headlights, Tom Mullins, linebacker and general rageaholic, leaped up onto the glass coffin suddenly enough to make the girls hop off. He looked completely wasted, face flushed and hair sticking up with sweat. “Hey,” he shouted, jumping up and down, stomping like he was trying to crack the glass. Lloyd was the kind of bad kid who liked to start fires and carried a knife to school. When teachers were taking attendance, they were hard- pressed to remember whether he wasn’t there because he was cutting class or because he was suspended. One night last spring Lloyd took a sledgehammer to the glass coffin. It didn’t shatter, but the next time Lloyd set a fire, he got burned. He was still in a hospital in Philadelphia, where they had to graft skin from his a** onto his face. Some people said the horned boy had done that to Lloyd, because he didn’t like it when people messed with his coffin. Others said that whoever had cursed the horned boy had cursed the glass, too. So if anyone tried to break it, that person would bring bad luck on themselves. Though Tom Mullins knew all that, he didn’t seem to care. Hazel knew just how he felt. 10 winners will receive a hardcover of THE DARKEST PART OF THE FOREST.US only. Holly, thank you for writing this. I'm really looking forward to reading it. This looks like another hit for Holly. Can't wait to read it :)!